Due to decades of distant monarchs, economic hardship, unchecked social tensions, and military disappointments, the ruling days of the Russian royals were numbered. The monarchy’s lack of attention to the needs of the peasants and workers allowed deep sentiments of distrust and dissatisfaction to fester. At the height of unrest and revolts in 1905, total revolution was prolonged by weak political appeasements. By 1917, the country was exhausted by the Great War and unable to handle the chaos at home as well as failure abroad, prompting Tsar Nicholas II’s abdication. Even after the emancipation of the serfs in 1861 by Alexander II, major social inequalities and the chronic economic gap continued to separate the classes, encouraging resentment and the notion of revolution to cultivate among the poor. While Russia suffered defeat in the Russo-Japanese War, the still largely agrarian economy suffered as well. The countryside was teeming with recently emancipated peasants that were still confined to their local communes, preventing economic growth and mobility. 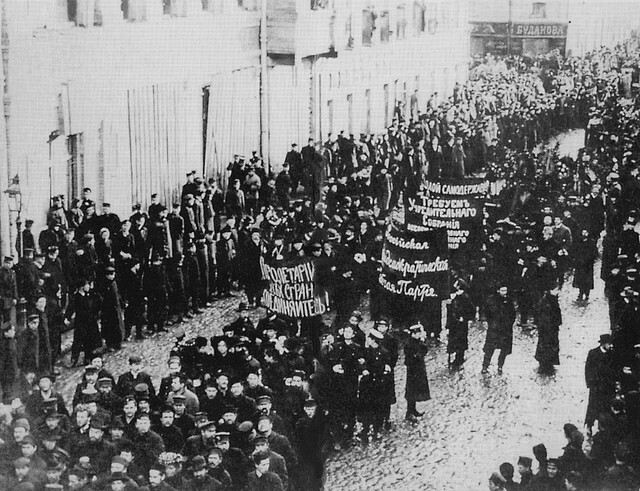 In urban areas, workers filled the streets to protest poor factory conditions, low wages, and lack of democratic rights. The most serious of these strikes occurred on January 22nd, 1905, when Tsar Nicholas II responded to a civil march with mass murder. This blunt display of repression and violence illustrated the Tsar’s lack of concern for general social and economic welfare, and his weak political reforms following Bloody Sunday failed to appease the oppressed people. The inevitable national revolution was delayed by a few pathetic political reforms, which attempted to ensure more rights, yet the democratic facade produced additional instability. Sergei Witte wrote the October Manifesto in response to the massacre at the Winter Palace, creating an elected assembly, the Duma, and the Fundamental Laws functioning like a constitution. Witte’s political changes had the potential to solve some of the primary issues in Russia, but they were ultimately crushed by the Tsar’s resolve for absolutism. Besides the Duma’s under-representation of the common people, the Tsar was able to dissolve the legislative and executive body at any time, as well as enact laws before the election of a new Duma, which prevented the legitimacy and productivity of the assembly. Furthermore, Tsar Nicholas made the Fundamental Laws into a hoax of a constitution in 1906, countering the democratic initiatives of Witte. The essence of these laws can be found in the Chapter I title: “The Essence of the Supreme Autocratic Power”; all 22 clauses of that chapter are focused on the Sovereign Emperor, who is “sacred and inviolable”. 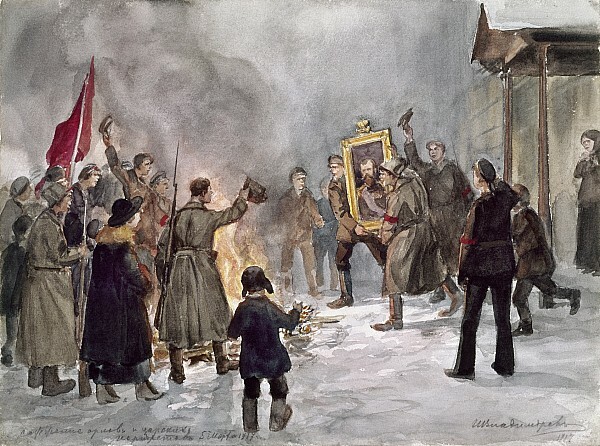 The Tsar undermined the political reforms, intended to transform the government, and crippled the constitutional monarchy before it could be earnestly instituted. Everything the Tsar touched worsened. Besides dooming Witte’s political reforms, Nicholas II also found time to take charge of the military during World War I, which had as much success as the previous excursions of Crimea and Japan. While Nicholas left the throne to play General, which was “a sign of weakness” (Freeze 267), the palace went through a series of Prime Ministers, including the widely despised Rasputin, who largely influenced Tsarina Alexandra. However sincere his effort to protect his people and homeland might have been, the reality of the situation was that the Tsar isolated himself from the turmoil of Petrograd, leaving the rioting nation in the unqualified hands of the Tsarina in order to fight a war only supported by the bourgeoisie minority. These irresponsible alterations only renewed the doubt felt by the people, who had no interest in the war. The people continued to revolt in the Tsar’s absence, and the countryside withered as its work force fought as soldiers, creating food shortages and more unrest. Before long, the army itself refused to back the Tsar, affirming the mass unpopularity of Nicholas II and indicating his loss of control. The unresolved social issues, economic struggles, unsuccessful political reforms and military exhaustion naturally led to revolution since all of these issues were either caused, worsened, or ignored by the autocracy. Nicholas II repeatedly proved to be apathetic, heavy handed, and incapable of genuine compromise, which paved the way for new ideologies such as communism, championed by the Soviets. The Tsar’s resignation on March 15, 1917 was only a matter of time, and the abdication of his brother signified the tragic but deserved conclusion of the Romanov dynasty. Did the War Cause a Revolution? Cool map of revolutionary Petersburg in your header!